Here is a profile of one of my favorite entrepreneurs alive today. I picked Russel Simmons because he has made his fortune leveraging the talents of under-represented creative individuals to launch lucrative enterprises such as Def Jam and Phat Farm. I love his philosophy of supporting up-and- coming creative talent; helping others to succeed and in turn becoming more successful himself. Simmons see opprortunities that others are blind to. 1978 As a sociology student at CCNY, Simmons begins promoting rap acts and managing Curtis Walker (aka Kurtis Blow). 1979 Quits school and launches Rush Productions. 1982 Signs his little brother, Joey (aka Rev. Run), and unleashes Run-DMC’s monster single, “It’s Like That,” in 1983. 1984 Creates the Def Jam record label with producer Rick Rubin. The next year, a CBS distribution deal makes Def Jam the largest rap label in history; the roster now includes Slick Rick, Public Enemy, the Beastie Boys, EPMD, 3rd Bass and Onyx. 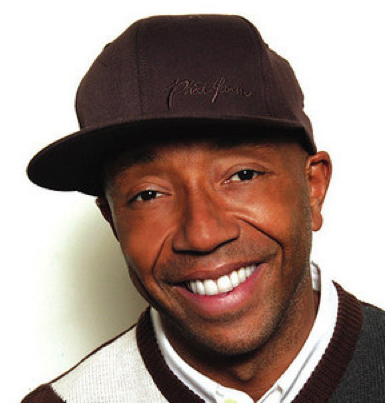 1991 Debuts Russell Simmons’ Def Comedy Jam on HBO. Over seven seasons, it becomes a showcase for black comedy stars including Martin Lawrence, Chris Rock, Jamie Foxx, Bernie Mac, Cedric the Entertainer, D.L. Hughley, Steve Harvey and Chris Tucker. 1996 Produces Eddie Murphy’s comeback film, The Nutty Professor, grossing over $273 million in sales worldwide. .
1999 Before the music industry collapses, sells the last of his shares of Def Jam for $100 million to the Universal Music Group. Stays on as a titular chairman. 2001 Russell Simmons’ Def Poetry Jam debuts on HBO. Becomes co-chairman of the Hip-Hop Summit Action Network, a philanthropic group focused on educational projects and social change. 2005 Teams up with Unifund Corp. to launch UniRush Financial Services and the Rush Visa card. UniRush now has revenues of more than $1 billion a year. 2008 Creates Global Grind, a hip-hop blogging site with a political edge and 40 million fans.